We are going to create a very simple app, with a button which when clicked, will play the desired sound. We will also have a second button which, when clicked, will stop the audio. Firstly, we'll need a sound file to play. It is important to note at this point that audioclips in Livecode can be in either .WAV, .AIFF, or .AU format. The sound file I'm going to be using throughout this lesson is called "hello.aif", and is going to be located in the same folder as the application. In Livecode, open a new mainstack and create a button on it, as above. There are two main ways we can access the audio file in Livecode: we can either reference it by it's filepath, or we can import the sound directly in to Livecode. The latter method means that we don't have to worry about the file getting lost or separated from the stack, as the file is integrated directly into the final application itself. The former method is, however, slightly more flexible in some situations and can avoid 'bloating' of the final application file. Note that the filepath you should enter will be different from the above, depending on where you have stored your audio file on your computer. Alternately, you can use the specialFolderPath function to automatically create a path to certain places such as the desktop - more on this later. Once you have entered this, click the Play button on your stack. You should hear the audio file you entered playing - if not, check to make sure that you entered the filepath correctly. Click this new button, and the loop will stop. It's also worth noting that 'play empty' would have the same effect; this can be useful in some situations. Click the play button - the sound will play, and when done, a message box will appear. In cases where you don't want to import the audio files directly into your application, and particularly on mobile devices, it's rarely practical to reference the audio file by an absolute filename as we have done in the examples above. There are some built in functions in Livecode that make it easy to access audio files (and files in general) dynamically. Firstly, there is the specialFolderPath function. This function returns the filepath to common folders such as the 'Documents' folder, or the Desktop. 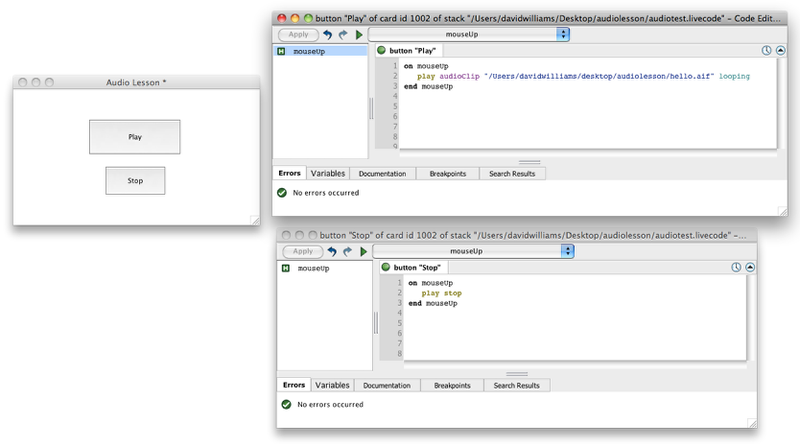 For example, specialFolderPath("Desktop") returns the path to the desktop on any Mac OSX machine. For a full list of the folders this function can handle, see the dictionary entry for specialFolderPath on this site, or in Livecode. Therefore, the following code will always give us the path to the folder our stack is in, making it simple for us to access any audio files we included when buliding the app. Using a method like this to access your files is essential on mobile devices, where the path to your stack folder will vary wildly from device to device. Prev: How do I move between cards in my stack? Next: How do I Create an ANSI Font Menu? How do you import the song into the application? You can import the song into the application by including it in the Copy Files pane of the Standalone Application Settings. How do I play an audio file from a url (stored somewhere in the web)? you can play an audio file from the internet by using a player object. You can find more information about this in the LiveCode Dictionary if you search for the term "player"
I am developing for Android and I have tried the "play Soundfile" object using both [play filename] and [play audioclip filename], where filename is the correct character string full filename. I also have used the [play stop] command. The play command causes only loud static and the play stop turns it off. Using the standalone Windows Media Player the file plays properly. I get this result both with wma file type and with mp3 file type. I also tried using the Quicktime player from the tools palette but, when I assign a file with filetype .wma the start/stop bar of the player disappears and there is no way to start the player. If I assign a .mov file to the QTP and expand the player box large enough to accomodate the video, the video does play (although haltingly). I really need the audio play function with .wma or .mp3 files for my app. Android supports mp3 files but not wma files. There are a number of reasons why the mp3 files may not be playing. In particular, check that the file path uses the appropriate case. The Android Filesystem is case sensitive. Also ensure that you use the forward-slash "/" in your path name. Also try using "specialFolderPath" to point to the root of the path where you store the mp3 files. What I'm not seeing is how to use media stuff (like getting the duration of an audio clip) from a clip that is loaded into a stack rather than being loaded from an external file. The commands all seem to be set up for external files. Is there some documentation explaining this? yes, for mobile applications you access audio files that are part of the application bundle. In this case, the audio files are separate and are not stored in the LiveCode stack. 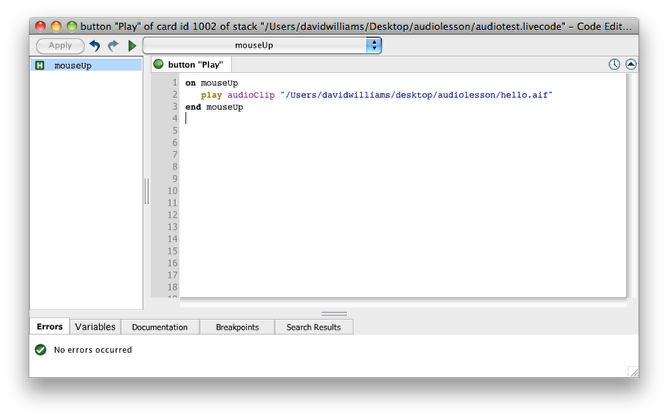 On desktop, you can include audio files in your LiveCode stack. Have a look at "audioClip" in the LiveCode dictionary. You can get the length of an audio file by searching for "duration" in the LiveCode dictionary. You can find out more about the player object by selecting "Object->Player" in the left hand side of the LiveCode dictionary. In relation to the playing of audio files and the 'wait until the sound is done' code, is there a way of stopping further sound files from playing while an initial sound file is playing but not stopping other events from going ahead? indeed you can. Have a look at the "wait" command in the dictionary. In particular, you may want to try using "wait until the sound is done with messages". A small example may be something like the following. This allows you to hit the "yes" button several times to launch another dialog, while the sound is playing. answer "doing something" with "yes" or "no"
Thanks Hanson, I'll try that. "In relation to the playing of audio files and the 'wait until the sound is done' code, is there a way of stopping further sound files from playing while an initial sound file is playing but not stopping other events from going ahead?" This was satisfactorily answered, thank you, but I have an additional question on this theme. Is there a way of stopping everything but a limited number of functions or even just one function while the sound file is playing? For instance, I might want to have a 'Quit' function that still works while everything else is overridden by the audio output. sorry for using your surname to address you last time. 1. You may want to hid any buttons the user should not be using while a sound is playing. You can conveniently hide a number of buttons by adding them to a group and hiding the group. Have a look at dictionary for the "visible" property. 2. If you want to keep buttons visible you could set a flag when you start to play a sound and unset the flag once the sound has stopped playing. You would then test for the flag each time you execute a command that you want to disable at play time. A flag may be a global variable that has a "true" or "false" state. 3. If you are running other actions that are supposed to stop, you may call a "stopMyActions" command before you play a sound and call a "resumeMyActions" (command names randomly chosen) command after the sound has finished playing. You would add code to these start and stop commands that control the execution of any other actions that may be running. I'm not sure those suggestions fit exactly what I'm looking for. Under the assumption that the code ('Wait until the sound is done') works to stop everything else in the handler that would otherwise occur until the audio is over, is there supplementary code (maybe that goes in the same line?) that would stop everything as usual but that would allow just one function (or a limited range of functions) to work? - which would stop everything as per usual but allow a user to engage a user-generated 'quit' button or 'quit' function? no, I am sorry, there is no short way to do this. answer "cannot do this at the moment - sound is playing" with "Okay"
answer "can do this - sound is not playing" with "Okay"
Any button that is not to be blocked does not require the if statement. So your "Quit" button could be implemented without any changes required. Also remember that you should set the global flag before it is used. Also, just wanted to say I have spend just a few days with LiveCode and love it! So I would just refer to dogbark and not the entire path. Is there a good way to help manage this in LiveCode? Thanks! great you are liking LiveCode. The closest you would get to a #define in C/C++ is the "constant" command. Have a look at that in the dictionary. You may also want to have a look at the "customProperties" property in the dictionary. put "You have won £0. Thank you for playing, better luck next time." into line 5 of field "Field"
and more similar, can some1 help? there could be a number of reasons why your audio clip is not playing. You do not provide enough information in your comment for me to narrow the exact reason down. - This syntax should only work on desktop machines, not on mobile devices. - Check that the sound file exists and the path is correct. - Check that the sound file contains the appropriate data in the format you specify. Sorry I took so long to get back to you, I'm creating a lottery program in livecode for my advanced higher computing project, got it all fine and working apart from the sound. It gets 6 numbers from the user then generates 6 random numbers then compares the 2 lots of numbers. It then displays the numbers they chose, the six the computer genterated and how many matching numbers. For the project I needed to fit file handleing in, I figured the easyest way would be sounds so tried to use the code above to have it play different sounds based on how many matching numbers they have. At the moment it is in a case statment as my previous post showed. But the code doesn't work. The tips you had don't work. I am doing it on my laptop so should work, the file path is correct, I just cut it down in previous post as it goes through around 15 folders and they are in wav format which should work. okay. We need to break this down a bit. If this does play the sound, then your program is probably not entering the case statement. Try adding some breakpoints and stepping through the application as it runs. Thank you for your help. Tried playing the windows sounds and it worked. The problem is probably the sound files I am trying to use. Will get new sound. I'm learning to use Livecode and I find it great! I'm doing lots of tutorial in order to improve but I have a problem with the sounds. Is there a way to set a soundtrack that plays automatically when the app runs, exactly like a musical background? Where can I find a help for the right script? Sorry if you've just answered to this question, so please redirect me to the post! I've been creating an app (translated in 3 languages) for FREE didactical use. play audioClip "SOME AUDIO FILE"
This also opens the message box and counts to 1000 in a total of 10 seconds, showing you that LiveCode is doing something else at the same time while the sound is being played. If you are working on mobile platforms then have a look at the dictionary entry for "mobilePlaySoundOnChannel". I'm working on an android tablet app with buttons on the screen, each plays a sound. I can get it to compile stand alone for windows but not for android. I include the sound files in the Copy Files area of settings. The windows app works and runs fine. I need it to work for an android tablet. Any help appreciated. Thank you for a wonderful program such as LiveCode! from your comment alone it is very hard to say where you are going wrong. You can play sound on android. I will point you in the direction of lessons that should cover all the information required to deploy to android. Go trough the lessons from top to bottom and decide what you have already covered and what is still outstanding. Hope that helps. If you come across a command/function that starts with "iphone", then check in the dictionary if the equivalent "mobile" version is available for android. I'm making a game for android device. How do I import an audio file so it is compatible with android format. I want to use the import function instead of this way. New to Livecode. Working through the lessons and all is going well. However, I just can't seem to get the sounds to work. I'm working on my laptop (windows) and I've tried various different wav audio files and even tried to move the file to variuos different locations but nothing seems to be working. I have even tried to import the sound file directly onto the stack and when I open up the application browser the audio files is showing up but it just does not want to play. The audio files that I have tried work normally when I open them up directly from their folder in VLC media player. "File -> Import as Control -> Audio File ..."
This places the audio clip on an "Audioclips" card. - The audio settings, are they not set to mute. - Did you try different audio file formats. Maybe there is something wrong with the particular .wav file you are using. In particular the codec used by LiveCode may be different to the one used with VLC. Please help. Do I need to install Quicktime? I had a previous app written with the community 6.1.1 and it played .wav files just fine, but now it will not. put there is an audioclip "mySound.wav"
If none of this helps please contact support@runrev.com letting us know what platform you are working from and perhaps including a sample stack, or even just the sound file for us to investigate. 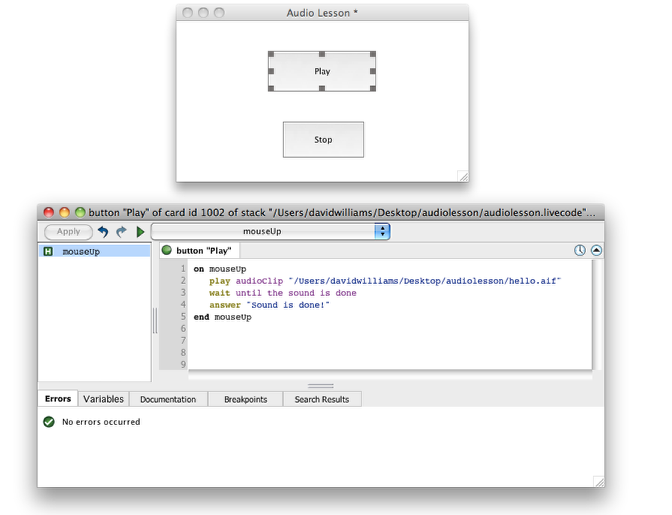 Using the run (browse) tool, I am able to play the sound (by pressing a button) and stop the sound (by pressing a different button) in my stack. The sound still plays in the iOS simulator, but it does NOT stop when I click on the stop button. Any ideas? The audioClip object is not supported on mobile devices, try using the play file command with a file path e.g. We will also update the play command documentation to clarify this. I trying to play an .mp3 file that I imported as control on a Nexus 7 but can't get the file to play. I used the special path function but that doesn't seem to help. Can you help? If this doesn't help perhaps you could paste the line of code you are using here so we can take a look at it. I have recently attempted to play an audio piece using LiveCode and the audio only comes back as static. if prize_result = "You Lose!" then play audioClip "Sad_Trombone.wav"
I have imported the sound file as you told another user, through file. I also checked using the message box if the sound file was there. It was. Beforehand, since the mp3 file also came out as static (changed mp3 to wav). As a follow up to my previous comment, I have downloaded the wav version of the audio file. It still gives me static. What version of LiveCode are you using and what OS are you working on? If you can let us know we'll look into this. If audioclips are not working you could use a player object instead. Drag a player onto your stack, set the filename property to the sound file you want to play either in the Property Inspector or in code and then use the start command to start the player.